Northeast Technology Center has three mobile training units available to companies in Northeast Oklahoma. These trailers are designed to bring the best available training, equipment, and expertise onsite to your company. 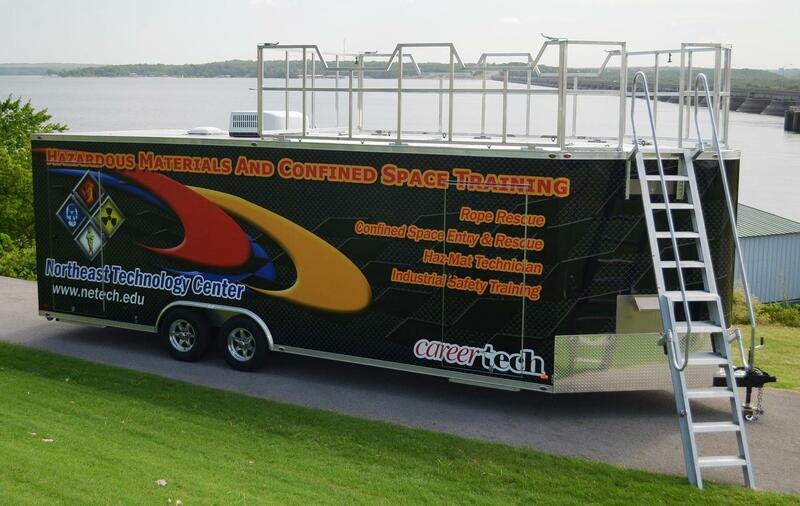 NTC is proud to offer the mobile Hazardous Materials and Confined Space Training Trailer as a top-notch training solution for your company or organization. This trailer provides mobile training solutions for rope rescue, confined space entry, confined space rescue, and all levels of hazardous materials training. The HAZMAT and Confined Space Training Trailer is outfitted with a guard-railed top deck, including manholes in the roof, which allow trainees to be lowered into and work in a confined space with all the latest equipment including SCBA’s, HAZMAT Suits, air monitoring equipment, and rope rescue gear. This unit also contains an interchangeable piping system that is used for horizontal entry and extraction simulations. Students will learn how to use all of the equipment, via hands-on training and will go through simulations, learning how to respond exercising OSHA compliance. This trailer allows our team to focus on hands-on, real-life scenarios. The training is convenient and completed on-site to incorporate your company’s facility in the training if possible, allowing students to train in the actual environment where they may be responding. Both NTC’s Hazardous Materials and Confined Space Training Trailer and Industrial Maintenance Training Trailer are climate controlled with interior lighting, so they can be used to train year round. 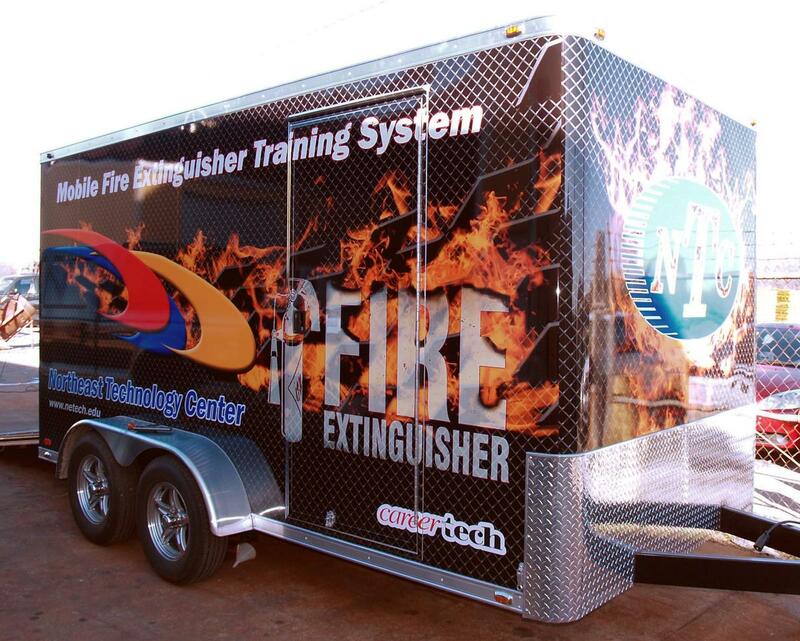 Northeast Technology Center’s Fire Extinguisher Training Trailer is our latest mobile training solution. Train your workforce on proper use and safety when combating fires with fire extinguishers. This hands-on training is available at your place of business. Train your employees on the safe use of portable fire extinguishers with real live-fire training. This training will help you comply with OSHA 1910.157 (g)(1-2).